The Speedmaster SX 52 is one of a kind in A3 format. Equipped with the latest technology, and tried and tested with over 40,000 units sold, it provides an alternative way for print shops to compete with web-to-print and digital printing. Open up new markets: the Speedmaster SX 52 sets standards whether with UV technology for premium finishing treatments or as an eight-color or perfecting press. Both smaller and large print shops can benefit from the Speedmaster SX 52. It is designed for high productivity with printing speeds of up to 15,000 sheets per hour. Thanks to the Prinect Press Center 2 control station, it is easy to operate and can be integrated into the Prinect workflow. 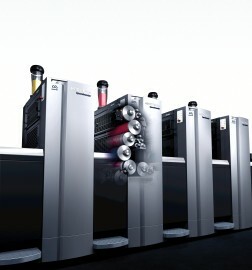 Another plus: each Speedmaster SX 52 is backed up by the comprehensive service offering from Heidelberg. This enables you to get the most from your printing press at all times thanks to perfectly coordinated consumables, maintenance, remote functions, and an international service and spare parts network. Count on the Speedmaster SX 52 and enjoy the confidence of a triple investment: in a press that will retain its value, in top quality, and in outstanding economy. Heidelberg makes world champions. Read more. The machine control station. Prinect Press Center 2. Ease of operation paired with intelligent automation, unique assistance systems, and excellent data management create the perfect conditions for sustainable efficient production. Learn more . The feeder (1) – The first step to successful production. The plate changer AutoPlate (4) works quickly and precisely and saves valuable makeready time – all without the need for tools. Perfecting device (2) with fully automated changeover for fast job changes - Fully automated changeover of the perfecting device takes less than a minute. All the key functions, such as changeover of the fully automated perfecting device, are controlled centrally via the high-performance Prinect Press Center 2 control station. Thanks to its cylinder concept the sheet travel only needs minimal air support. This is an important contribution to save valuable resources. The automatic washup devices (7) for the inking unit and blanket and impression cylinders ensure short washup times with customizable washup programs. The coating unit - When something very special is needed. The protective coating option gets you to the finishing stage faster, thereby reducing throughput times for your jobs. Ablilty to offer customers elaborate spot and metallic coatings of a consistently high quality. The dryer output can be matched automatically to the printing speed. The outstanding drying performance of our drying systems enables rapid progress to the finishing stage. Highly efficient drying with DryStar Coating saves you valuable energy and helps protect the environment. The delivery - Perfection all the way to the pile. Piles with neatly aligned edges reduce paper waste by preventing problems at the postpress stage. The ergonomic delivery control panel and the Prinect Press Center complement each other perfectly and optimize machine setup. The high-pile delivery results in fewer pile changes during long print runs than a standard delivery.